Positives; Nora- Fresh ,perky, endearing, full of energy. I like her. Flash's new uniform- Finally the Scarlet Speedster wears something scarlet. Caitlin's B story- I am intrigued, I just hope it doesn't drag on, I don't want 5 backstories going on at once. Negatives- Looks like the ever present melancholy will be affecting at least 2 of the cast. Too soon yet on "the villain". Still wish they would cut the season in thirds and have different big baddies. LOVED the ring. LOVED the Legion references. LOVED that Dexter Myles will be curating the Flash Museum in the future. I just all around liked this episode, and I hope it will be a good indicator of the season to come! Yeah Eric, the ring. THAT was marvelous!! I'll give it a look, but I lost a lot of faith in the show after seasons 3 and 4. The new suit does very weird things to Grant Gustin’s head. He looks like the Great Gazoo....but in red. Promising debut. They just. Have. To. Not. DRAG OUT. The big bad. Nora/XS is energetic and cute enough to convince me to give the show another four episodes to see if they can maintain or improve on the premiere. And David -- look at how Carmine Infantino drew the Flash in the '50s and '60s. Barry had a big freakin' head. So glad they didn't drag out Barry and Nora's secret and had them inform the rest of the team right away. They learned their lesson from both an in-character perspective and from an audience perspective that angsting over a secret for several weeks is a drag. They aren't dragging out the villain. Looking forward to seeing the new Wells. So far, quite good. I feel they are puting more care into the scripts. The characters' reactions and way of speaking seem a little more realistic. There is a nice balance of humour, action and creepiness. And the actress (sorry, actor) who plays Nora does a very good job IMO. They've brought John Wesley Shipp back in the 1990 costume for Season 5 for the "Elseworlds" crossover event. As I've seen noted elsewhere, I'm starting to hope that Jesse Martin is okay. He's been seated in every single shot they've had him in all season long, and his overall energy seems pretty off. All caught-up on The Flash and Supergirl -- really liking the stride these shows are hitting . . . I completely bypassed last season, need to get caught-up on last season's big crossover event, missed that altogether. "I'm starting to hope that Jesse Martin is okay. He's been seated in every single shot they've had him in all season long, and his overall energy seems pretty off." Was there an in-story reason for the new costume? We quit all the DC shows halfway thru last season. They were becoming such a chore to get thru. Was there an in-story reason for the new costume? 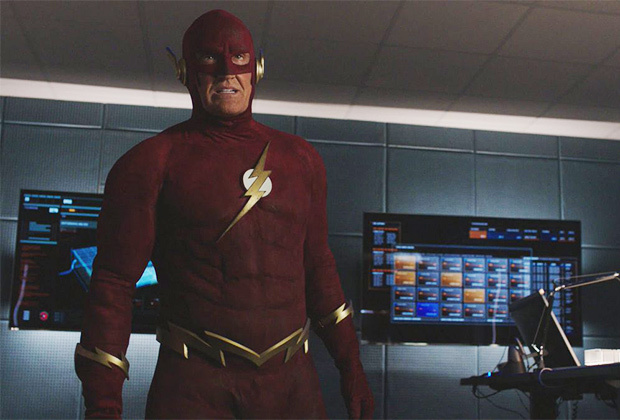 Barry’s suit was damaged in last season’s finale, so he puts on his original suit, which also gets damaged. Nora happened to have Flash’s ring from the future, which contained the compressed suit. Which, she mentioned, was designed by Ryan Choi! Hopefully he feels better soon and he's back on the show at full strength. Apparently Marvel Comics exists in the Arrowverse. I must applaud them for that. I think they've done it before too. I guess it's their homage to Stan Lee. They’ve made Marvel references in previous seasons. As a tangent, both Batman and Supergirl have been mentioned in Black Lightning. But those references have been vague enough that they might be real, or they might be fictional characters.